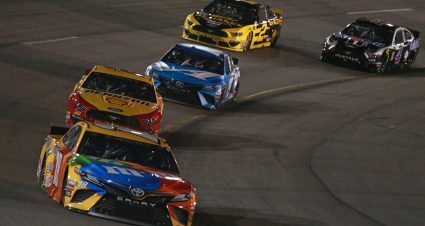 It’s still hard to believe Martin Truex Jr. was winless in 80 career Monster Energy NASCAR Cup Series short-track starts heading into Saturday night’s Toyota Owners 400 at Richmond Raceway. But the drought is finally over. Truex Jr. got the long-coveted win and did it with a perfect drive in the final laps holding off first Clint Bowyer then Joey Logano in a race to the checkered flag. It ended a streak the New Jersey native himself couldn’t figure out. 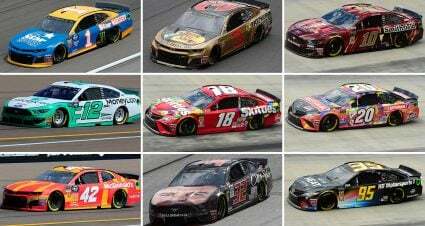 Truex Jr. became the season’s fifth different winner in the first nine races of 2019. While Saturday’s race was not by any means a rough and tumble short track affair, it made up for the lack of physicality with intrigue and good racing. In many ways, it was a very typical Richmond race of recent years. With one exception. Martin Truex Jr. ended the night in Victory Lane. 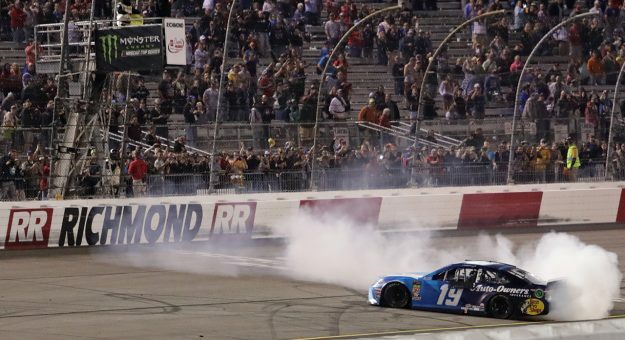 The Joe Gibbs Racing-Team Penske roll continued in Richmond and the two organizations continue to run the table. Only drivers from either team have won so far this season. 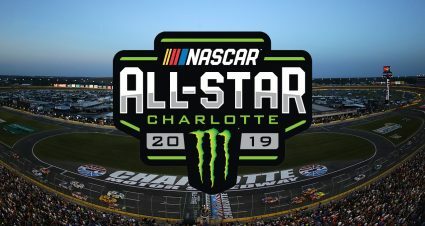 While Stewart-Haas Racing’s Bowyer and Kevin Harvick were near the front, neither had enough to end the impressive run that does not have any signs of slowing down. Kyle Busch looked like he had the field covered again the first half of the race until a pit road speeding penalty dropped him to the rear of the field. Not surprisingly he came back to at least get in the picture. But for the first time all season, Busch did not win a NASCAR national series race this weekend. So far 2019 has been a season Kyle Larson would like to forget. 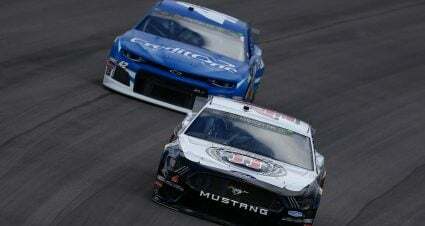 The Chip Ganassi Racing driver’s frustrating year added another chapter Saturday night with an early exit this time courtesy of a cut tire after picking up a fender rub from on track contact. It’s fair to believe the new rules package and the added downforce – more than double of last year’s rules – have negatively impacted Larson’s driving style. Larson has been much more successful driving looser cars in his NASCAR career and this year has had a difficult time adjusting as his statistic bear out. Cole Custer picked up an additional $100,000 payday when he won Friday night’s Xfinity Series Toyota Care 250. 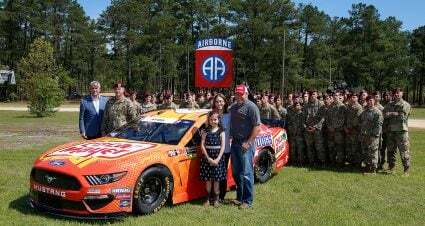 The Stewart-Haas Racing driver was the recipient of the bonus as race two in this year’s Dash 4 Cash program. While Custer was comfortably ahead when the checkered flag flew and led a race-high 122 laps, the race had several stretches of wild action with four-wide racing after restarts on display. 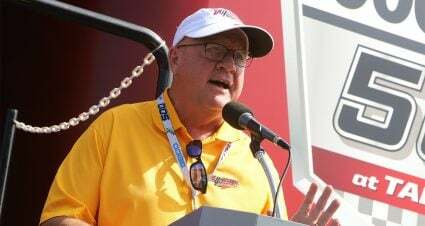 Once again the lack of Cup drivers in the field didn’t impact the amount of competition in Friday night’s race with the next Dash 4 Cash event coming up at Talladega Superspeedway in two weeks. This was my first trip to Richmond since the track’s recent renovation. The fan amenities including a new infield area that allows close access to the garage area and other attractions is a nice touch. 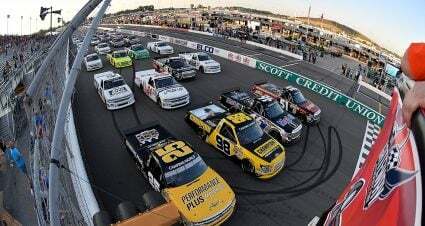 Tracks continue to upgrade in hopes of giving fans more creature comforts around the facility and Richmond has evolved into one of the top stops on the schedule.